I hear from a lot of expectant parents and parents of newborns who ask lots of interesting questions about what we actually do to save money with our infants. Though I’ve written lists before of the things worth doing to trim spending on babies, many of the people who write in are skeptical. Cloth diapers? Do you really do that? Don’t you need things like changing tables? What about clothes and toys and baby food? In short, yes, we really do this stuff. Given that, I thought it’d be worthwhile to post a visual guide to some of the ways we saved money with our infants. Currently, we have a boy who’s just shy of three years old and a girl who just passed her first birthday, so some of this stuff is still applicable (diapering) while other elements are starting to slip to the wayside (baby car seats and baby food). Here are some of the best ways we’ve found to save money on typical baby items and baby care. 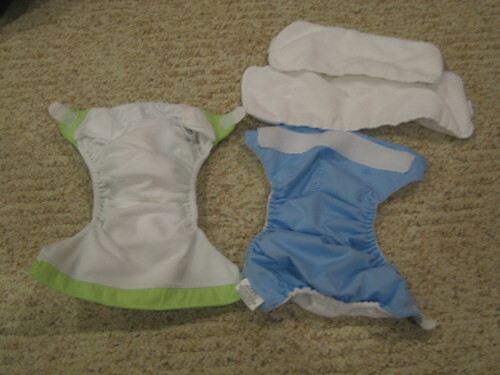 Above is a picture of two of the cloth diapers we use – bumGenius one-size-fits-all cloth diapers. As you can somewhat see from the picture above, each one is adjustable with a number of snaps so that they’ll fit any size baby, from newborns to a three year old that only wears them at night. They also come with extra pads (which you can see above the right one) for when they start to produce a greater volume as they get older. Taking them on and off is easy – they have a velcro strip across the front and the tabs just attach to the velcro, easy as pie. It’s just as easy as putting on and taking off a disposable one. If you intend to have more than one child, cloth diapers can be a substantial savings. A friend of ours, Carrie, did a great analysis of the cost and figured that you actually begin saving during the second year with a single child and the second one is incredibly cheap. She calculated a savings of $200 in diapers for a single child over two years – for two children over two years each, cloth diapers alone save about $800. That’s quite a chunk of change. What you see above is our usual “changing table.” Instead of buying an expensive changing table, we just use an old towel and change diapers wherever it’s convenient – in this case, on the floor of the family room. Not buying a changing table can easily save $50-100. You’ll also notice a piece of cloth laying there – that’s what we use for wipes. Originally, my wife just bought a large piece of flannel – the cheapest soft flannel she could find at the cloth store – and cut it down to wipe-sized pieces, then hemmed them with her sewing machine. If you don’t want to go to all that work, just get a jumbo pack of washcloths. It’s also useful to have a spritzer bottle with water in it (and sometimes a bit of witch hazel in with the water if you’re noticing diaper rash). This way, you can moisten the child’s behind a bit as you’re cleaning him or her up with the wipe. After the business is done, we just stick the wipe in with the used cloth diaper and we’re good to go! Not buying disposable wipes saves us about $100 a year or so per child, according to our thumbnail calculations. First things first – if you’re a parent of a newborn, you are going to touch soiled diapers. It’s going to happen, and within a week or two of changing several a day, you’re going to become so desensitized to it that you won’t even notice it. It’s simply a fact of life, and it doesn’t matter whether you’re using disposables or cloth diapers – you’re still going to be up close and personal with baby waste. With the cloth diapers, we just fold them up like this with the wipes inside when we’re done (and any solid waste is dumped in the toilet and rinsed). 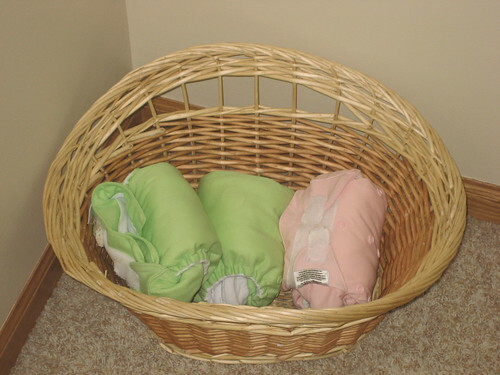 Our wicker basket is effectively our Diaper Genie (another waste of a purchase you don’t need to make). When it comes time to wash the diapers, we just spray a bit of deodorizer around the laundry room (mostly for our own benefit), then open them up, tug out the liners, and throw all of the cloth pieces into the washer. We do a load of nothing but wipes and diapers about once every three days or so. Then, when they come out, we stuff them how we like and fold them, usually in the family room in the evenings when we’re watching a movie or something. Easy as pie. Although we do have a “nice” diaper bag (received as a gift in our baby shower days), we often just use a simple canvas bag, especially for short trips. Just toss a few diapers, a few wipes, a spray bottle, a few toys, a bottle, and maybe a snack and you’re ready to go for almost any day trip. 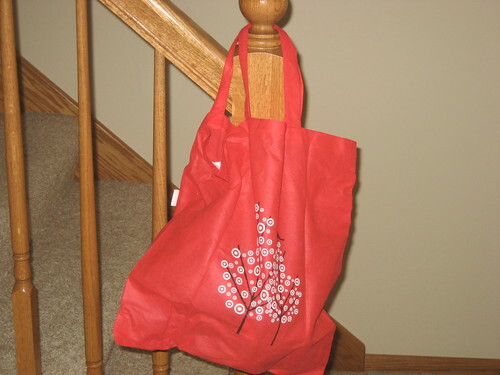 The canvas bag is convenient to carry and – best of all – they’re often extremely cheap (or in the case of the one depicted here, free). A good-sized canvas bag can take care of your diaper bag needs for just pennies. Don’t waste your money here. When the baby is young, the best solution of all is breast feeding, if it’s at all possible. The cost of a breast pump is negligible compared to the savings and health benefits one gets from breast milk over formula. Formula is fine if breast milk doesn’t work out, but breast milk saves you hundreds of dollars over formula in that first year, often paying for a nice electric pump in just several months. Then, if you have a second child (as we did), it’s pure gravy. 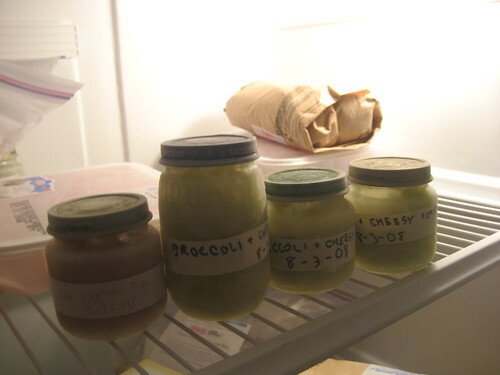 When the child gets older – especially in the six to twelve month range – they’ll be eating a lot of pureed and mashed-up baby food. While it’s easy to just grab the Gerber, it’s very expensive – $0.50 a pop really adds up if your child knocks back two of those per meal. Why not just give them a bit of your own table food? Just take some of your vegetables, soups, stews, and other things, and just blend them into goop in the blender, then pour them into individual jars (as we did above) or into an ice cube tray and pop them in the freezer. You can save $75 easily this way, plus you’ll have greater control over the freshness and quality of what’s going into your child’s stomach. Toys, clothes, and bibs are what yard sales are made for. Baby and toddler clothes at yard sales are only lightly used – a child usually only wears an outfit four to six times before they’ve outgrown the clothes at that age, at which point they head for the yard sale tables. Buy them in bulk – make an offer for everything that’s there and you can save $100-200 a year on baby clothes. For bibs, the story is much the same – get them at yard sales. You can also get tee shirts much larger than your baby – toddler and small children’s shirts. Just put the shirt on over the baby before they eat instead of a bib – the tee shirt becomes the bib and can be pulled right off when done. This is a great (and cheap) tactic to use when they self-feed for the first few (dozen) times, as it can be very messy. Yard sales are also a place to get toys on the cheap. Just take your kid along and watch what they’re drawn to. The basketball hoop above was a yard sale find – our son fell in love with it around fourteen months and we picked it up for a dime. He still plays with it multiple times a week, almost two years later. 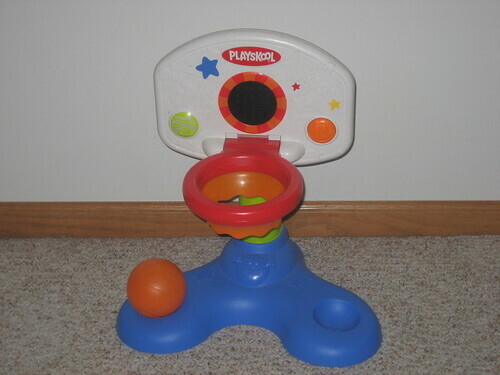 Additionally, just allow your kids to play with items around the house. There’s nothing more exhilarating than entertaining your child with a wooden spoon and several overturned pans in the kitchen. It’s a loud racket to be sure, but it’s great fun and a great learning experience for your kid. The point is don’t spend a lot of money on new toys, clothes, or bibs. There are plenty of cheaper options that are just as good. Although we found lots of places to skimp, there were a few places where we didn’t, and they can be described in one word: safety. Crib We invested in an extremely sturdy crib for our son when he was first born and it was well worth it. He jumped up and down in it, tossed around at night, and tested the sturdiness of it time and time again (and still does, on occasion) – and it’s never budged an inch. Later, when we found we had a second child coming, we bought him a reasonably priced but very sturdy bed and had his little sister move into the crib. 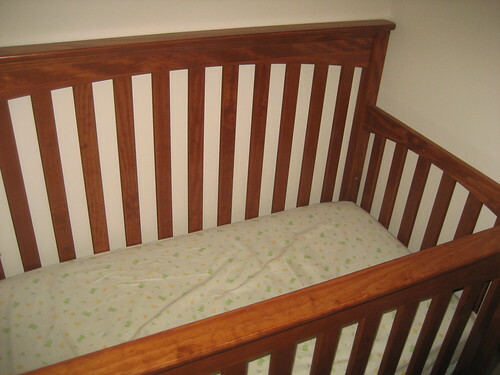 The sturdiness of the crib was well worth the cost – we never worried for an instant about the safety of either child. Car seat We spent plenty to get the safest, sturdiest car seat we could find. Later, we bought the safest, sturdiest toddler seat we could find. In the event of an accident, we wanted the greatest chance possible of the complete safety of our children. Safety is an area we don’t skimp on. Bottles For us, this is a safety issue. If we were starting over again, we would likely buy glass baby bottles – if we went plastic, they would absolutely be free of Bisphenol A. My wife majored in chemistry in college and she’s extremely concerned, so I tend to trust her on this one.